With the help of the audio, you can give your listening skills a boost as well as practice your pronunciation. 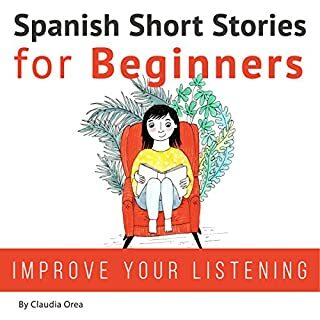 Recorded by a professional voice talent from Madrid, Spain, the stories are narrated using a standard Spanish voice at a slightly slower speed than how actual Spanish people speak. The stories are written using a wide range of vocabulary and diverse grammar structures. The carefully selected combination of dialogue and descriptions is especially suited for beginner to low-intermediate level learners. Ten entertaining stories about everyday themes that are short enough to hold your attention, but long enough to make you feel a sense of accomplishment and progress after finishing each one. Easy to follow, great for beginners! Yes, I would recommend this audiobook to a friend because it is so easy to follow along and understand. I didn't particularly have a favorite character because they all carried something interesting that I could relate to. What does Abel Franco and Lucia Bodas bring to the story that you wouldn’t experience if you just read the book? They bring so much authenticity, real life situations, and everyday language in these stories. The tone really helped how words should be pronounced and communicated. I wouldn't get this from just reading the book. No, I would break up the book by stories and really digest each book if you are a beginner to better understand the concept and story line. A really great audiobook for beginner. No purchase regret at all! Best Spanish Material I've tried so far. Would you listen to Learn Spanish with Stories for Beginners again? Why? Most definitely yes! The materials are great and the audio is easy to understand. Everything about it. The simplicity and discourse. Have you listened to any of Abel Franco and Lucia Bodas ’s other performances before? How does this one compare? This is not the first Spanish learning material that I've tried. And I must say that this is probably one of the best if you wanted to learn faster. I love that the narration is slightly slower compared to a normal conversation which allowed me to get a better grasp of the pronunciation which is important for beginners like me. I was particularly interested in learning words that I can use in casual conversation which this book was clearly able to help me with. Not only do I know now how to speak casual Spanish but the audio recording has also helped me fix my accent and tone when speaking Spanish. 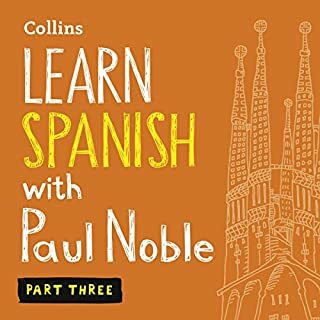 Compared to other Spanish learning materials, the recording in this book has been well recorded and is a pleasure to listen to. I would definitely recommend this book to anyone who wants to learn how to speak and write in Spanish whether you are a beginner or intermediate learner. 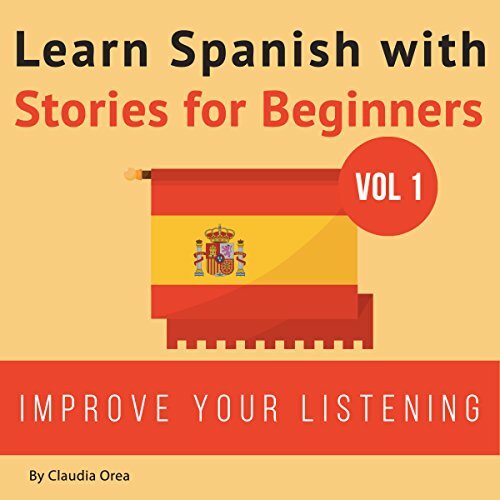 Would you consider the audio edition of Learn Spanish with Stories for Beginners to be better than the print version? Maybe the translator should repeat English twice so that the listener will easily remember the terms. Okay, today I was searching on Audible for something to read "hear" about the Spanish language as my language of choice for learning and the best way for me is to learn by myself.And suddenly I saw this title"Learn Spanish with Stories for Beginners"and got me interested I never used to learn some language with listen to stories and it was a fun and innovative way of learning something new.The stories are interesting to listen and the narrators also have a good vocal abilities (especially the male vocal sounds like someone narrated a "telenovela" to me), I read some say they sound "BAD" yes i can agree but I know Audible or any other Online Service is put too much "Compression" on vocals it all came from "Loudness War" (I don't want to offend somebody here with this statement just to point).The stories are great well thought and for Beginner like me the PDF file I downloaded is the best tool to follow the stories with ease and as I mentioned the stories with the male narrator get me in the state as i "Watch" some telenovela.And for the last thought, I love the vocabulary it is great for beginners to "hear" the words pronounced definitely, I learn something here!So all in all great idea from the maker I hope there are more languages translated like from where it came to the title:"New way of learning your favourite language". Yes, just enough to have time to understand and absorb each story. I have learned Spanish years ago, and it really was an enjoyable experience to be able to understand and speak the language even just the basics. Unfortunately, I was not able to continue studying further the language and using it. That’s why with the purchase of this audiobook, recollections of what I had learned came back. I may not fully understand all the things the speaker is saying but I at least I have a grasp of what the story is all about. These are easy to comprehend stories, easy to follow along with the help of English translations and I can definitely learn about the proper accent. I would recommend this to those who want to learn the Spanish language in a different and innovative way, but surely interesting! The fact that the pronunciation was so well integrated into the design of the audiobook was one of the things I loved about this audiobook. I find that that is one of the most difficult parts of learning another language and to have it readily available is great. It increased my interest in the language simply by letting me understanding it better. I know what parts of the language interest me more thanks to this audiobook. The information that is presented in exactly what you'd expect from a language book, but it's also so much more with stories that stick in your mind to help you remember key vocabulary words. I wouldn't change a single thing about it. I highly recommend this audiobook to anyone looking to learn a language quickly and efficiently. I would listen to it again for revision and betterunderstanding of the stories and vocabulary used in them. What about Abel Franco and Lucia Bodas ’s performance did you like? It sounded authentic and helped me to immerse myself in the languageenvironment. No,because it's a language learning book. I listened to parts from it ona daily basis, sometimes coming back to the stories I alreadylistened. Fantastic at improving your listening skills! It is a different way of learning. For people who are more auditory than visual at learning, this is perfect. What was one of the most memorable moments of Learn Spanish with Stories for Beginners? It would have to be the first story about watching movies and deciding on genres and debating on them, as I am a film aficionado! Abel brings the stories to life. Lucia teaches you how to pronounce the new learned words correctly and in which context. While I studied Spanish in High School for a few years, it has been a while I did not practice it. This book helped me refresh my memory in a very engaging way. 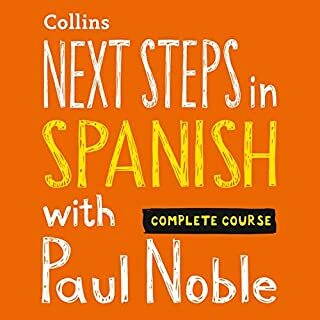 If you have an interest in learning Spanish and you want to strengthen your skills, then this is the book for you. It was very informative so you might learn some new things. If you could sum up Learn Spanish with Stories for Beginners in three words, what would they be? It was amazing. I learnt a lot. I have a few trips to Spain coming up, so I bought this book to remember my Spanish and to get used to the accent used in Spain, (as I learned my Spanish in Latin America). I like to listen to it on my morning commute, and after some experimentation, I found a method of using it that works for me. There are ten stories, each about 12 minutes long, one per chapter. The next ten chapters go over the vocab of each story, stopping every few sentences to go over vocab. This is super helpful as I don't need to bother with looking things up in a dictionary. The way I've found works best is to listen at 0.75x speed to the original story, then skip ten chapters ahead and listening to the version of the story that's interspersed with vocab definitions. Then I listen to the story again at a normal speed. I like that the stories are about both usual situations and unusual ones (like about astronauts). Would recommend for an intermediate Spanish speaker. So far it feels like my listening skills have gotten better and vocab has improved. 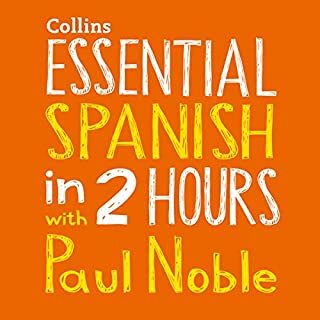 I'm glad I found this audiobook because by the time I'm in Spain, I'll be speaking enough to get by! I listened to these stories whilst driving and thought the narration was quite clear. I found the Spanish easy enough to follow at a pace that was challenging at times but with a second listen, I was able to follow the story. Each time I listened, I understood more. The frustrating thing was the lack of any definitive break between when one story ends and the other begins. There was not even a few seconds pause. This was very difficult to follow when you are trying understand and translate as you listen.